A comparison of the performance of Kalpana and Meteosat-7 WV radiances in the ECMWF NWP model. Quart. J. Royal Met. Soc., 137, 1573-1580. DOI: 10.1002/qj.848. A very wet day over Ireland. Weather, 65, 298. 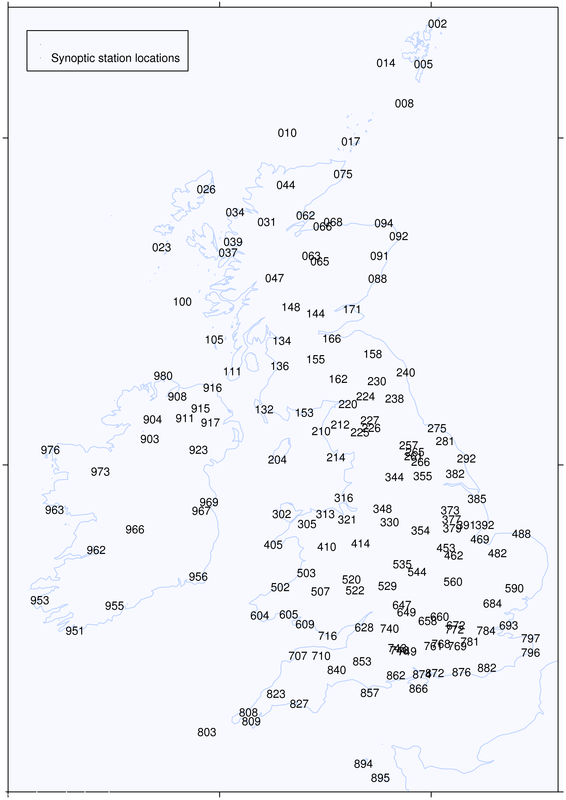 Forty years of the Climatological Observers Link. Weather, 65, 139-143. From observations to forecasts - Part 5. New forms of meteorological observations and information. Weather, 65, 100-104. The GlobMODEL Demonstrator: Assimilation of new satellite products in an operational meteorological center, IEEE Journal of Selected Topics in Applied Earth Observations and Remote Sensing, 2, 213-224, doi:10.1109/JSTARS.2009.2021770. A showery mid-May over the British Isles, Weather, 64, 182. A fast radiative transfer model for the assimilation of water vapor from the Kalpana very high resolution radiometer, Geophys. Res. Lett. , 36, doi:10.1029/2009GL037852. Four-dimensional variational assimilation of ozone profiles from the Microwave Limb Sounder on the Aura satellite, J. Geophys. Res., 113, doi:10.1029/2007JD009121. Evaluation of ozone total column measurements by the Ozone Monitoring Instrument using a data assimilation system, J. Geophys. Res., 113, D15S21, doi:10.1029/2007JD008779. Equatorial Kelvin waves as revealed by EOS Microwave Limb Sounder observations and European Centre for Medium-Range Weather Forecasts analyses: Evidence for slow Kelvin waves of zonal wave number 3, Journal Geophysical Research, 112, D16106, doi: 10.1029/2006JD008329. Assimilation of stratospheric ozone from MIPAS into a global general circulation model: the September 2002 vortex split. Quart. J. Royal Met. Soc., 132, 231-257. An Observing System Simulation Experiment to evaluate the scientific merit of wind and ozone measurements fm the future SWIFT instrument. Quarterly Journal Royal Meteorological Society, 131, pp 503-523. From Sputnik to Envisat, and beyond: the use of satellite measurements in weather forecasting and research. Part 1 - A history. Weather, 58, 107-122. From Sputnik to Envisat, and beyond: the use of satellite measurements in weather forecasting and research. Part 2 - Data assimilation and weather forecasting. Weather, 58, 140-143. From Sputnik to Envisat, and beyond: the use of satellite measurements in weather forecasting and research. Part 3 - Envisat. Weather. 58, 182-186. Assimilation of ozone profiles and total column measurements into a global general circulation model. J. Geophys. Res., 107, 10.1029/2001JD000957. The UGAMP Use and Diagnosis of the ECMWF Meteorological Analyses. Systems Analysis Modelling Simulation, 42, 1615-1621. The weather of 1850. Weather, 55, pp 9-12. Meteorology and the Internet - Climatological information. Weather, 54, 403-404. East Pacific Hurricane Linda. Weather, 53, 19-20. Meteorology and the Internet - El Nino. Weather, 53, 314-315. The Indian cyclones of early June 1998, as seen from Meteosat-5. Weather, 53, 363-364. Back to basics: Atmospheric stability: Part1 - basic concepts. Weather, 51, 134-140. Meteorology and the Internet - satellite imagery. Weather, 51, 143-145. Meteorology and the Internet - mailing lists and newsgroups. Weather, 51, 431-433. Heatwaves and record temperatures in North America, June 1994. Weather, 50, 20-23. Meteorology and the Internet - current surface weather information. Weather, 50, 387-389. The Climatological Observers Link. Weather, 49, 35-36. The blizzard of 12-15 March 1993 in the USA and Canada. Weather, 49, 82-89. Computer networks and meteorological information. Weather, 49, 298-306. The record-breaking low temperatures of January 1994 in the USA and Canada. Weather, 49, 337-346. The floods of October and November 1894 in southern Britain. Weather, 49, 383-390. The Alabama tornado outbreak of 27 March 1994 - an example of tornado formation. Weather, 49, 407-411. Mean climate and transience in the tropics of the UGAMP GCM: sensitivity to convective parameterization. Q. J. R. Meteorol. Soc., 120, 881-922. Drought and disaster in 1893. Weather, 48, 134-141. Three years of warm weather over the British Isles, 1988-1990. Weather, 47, 230-236. Multicell stage of the Munich hailstorm of 12 July 1984: a numerical study. Tellus, 44A, 339-355. The record-breaking heatwave of 1 - 4 August 1990 over England and Wales. Weather, 46, 2-10. February 1891 - The driest month on record over England and Wales. Weather, 46, 34-38. The cold snap of February 1991. Weather, 46, 222-231. Two remarkably sunny years in southern Britain - 1989 and 1990. Weather, 46, 384-390. On the time-averaged flow of quasi-geostrophic wind-driven gyres. J.G.R. (Oceans), 93, 15427-15436. Low daytime temperatures over England and Wales on 12 January 1987. Weather, 42, 146-152. Letter: The Berkshire thunderstorms of 22 and 23 July 1984. Weather, 40, 296-297. A mechanistic model of grass root growth and development dependent upon photosynthesis and nitrogen uptake. J. Theor. Biol., 116, 443-467. The effect of physical processes on numerical simulations of two-dimensional cellular convection. Beitr. Phys. Atmosph., 58, 417-440. A growth model of root mass and vertical distribution, dependent on carbon substrate from photosynthesis and with non-limiting soil conditions. Annals of Botany, 55, 563-577. Shoot-root-nodule partitioning in a vegetative legume -- a model. Annals of Botany, 54, 653-671. Various articles and notes published, as Editor, in the monthly Bulletin of the Climtological Observers Link. The weather in Reading during 2017. The Reading Naturalist, 70, 70-73. published by the Reading and District Natural History Society. The weather in Reading during 2016. The Reading Naturalist, 69, 70-73. published by the Reading and District Natural History Society. Setting Up a Weather Station and Understanding the Weather: A Guide for the Amateur Meteorologist. Publisher: The Crowood Press, ISBN 9781785001611. See here for details. The weather in Reading during 2015. The Reading Naturalist, 68, 77-80. published by the Reading and District Natural History Society. One hundred years of Reading Weather. Publisher: Climatological Observers Link, ISBN: 9780956948519. See here for details. The weather in Reading during 2014. Silehammer, 24, 70-73. published by the Reading and District Natural History Society. Wettest February on record adds to winter of extremes. A summary of the winter of 2013/4 in Reading in the University news pages here. The weather in Reading during 2013. The Reading Naturalist, 66, 74-76. published by the Reading and District Natural History Society. 2013: the year in extreme weather. An invited piece for The Conversation blog, published online. The weather in Reading during 2012. The Reading Naturalist, 65, published by the Reading and District Natural History Society. The weather in Reading during 2011. In The Reading Naturalist, 64, 75-78. Published by the Reading and District Natural History Society. The ERA-Interim archive, version 2.0. ECMWF ERA report series, No. 1. 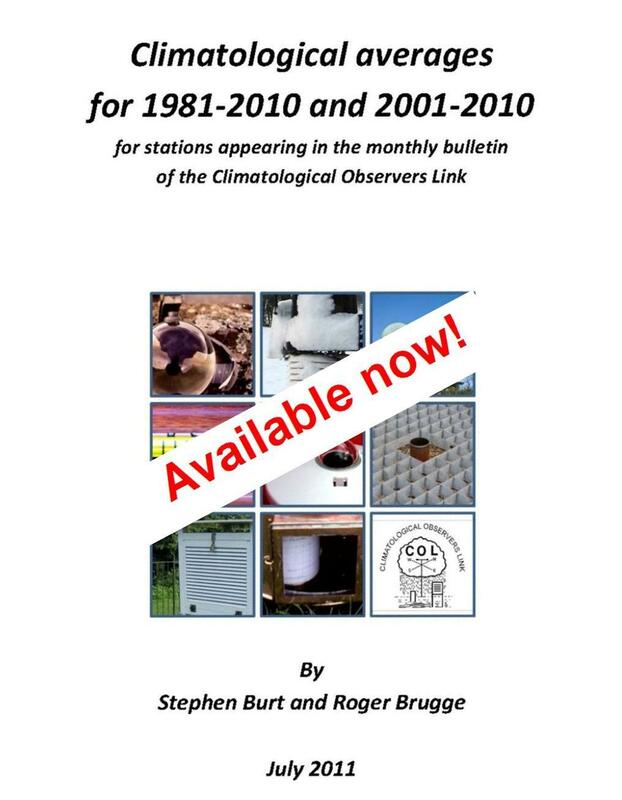 Climatological Averages for 1981-2010 and 2001-2010 for stations appearing in the monthly bulletin of the Climatological Observers Link. ISBN 9780956948502. The weather in Reading during 2010. In The Reading Naturalist, 63 64-66. Published by the Reading and District Natural History Society. The weather in Reading during 2009. In The Reading Naturalist, 62 64-66. Published by the Reading and District Natural History Society. Kalpana water vapour channel radiances; their inclusion into a fast radiative transfer model and subsequent use in the ECMWF IFS forecast model. ISRO internal report, 62 pp. Validation of OMI TOMS-V8 total ozone columns using a data assimilation system, Proceedings of the Envisat Symposium 2007, ESA Special Publication SP-636, July 2007. Atmospheric Wind Speed Retrieval from MIPAS Measurements. Final Report, April 2007, ESA-ESRIN Contract No. 17896/03/I-LG. Geophysical data retrieval algorithms developments for a DIMIWO. Final Report, June 2005, ESA-ESTEC Contract No. 17691/03/NL/FF. Assimilation of Ozone and Water Vapour into the Unified Model. Proceedings of the Envisat/ERS Symposium, Salzburg, 6-10 September 2004. Assimilation of ozone and water vapour into the Unified Model. ESA Special Publication SP-572. SWIFT - Application of Stratospheric Wind Measurements to Process Studies and Meteorology. Final Report, April 2003, ESA ESTEC Contract No 15344/01/NL/MM. Evaluation of Envisat data using a NWP system: A vortex-centred view. ESA Special Publication SP-531. Taking a global view: The NERC Data Assimilation Research Centre. NERC News, Summer 2001. Envisat Data Use Programme - Technical note. Web Community: Atmosphere, Weather and Climate. A report written for BNSC under contract number ESYS-2001299-SCT-ReadingUni/1. The assimilation of Microwave Limb Sounder-measured temperatures into the Unified Model. NERC DARC Technical Report #1, August 2000. Diagnosis of the ECMWF Re-Analysis dataset by the Centre for Global Atmospheric Modelling. UGAMP Technical Report No. 48, 13pp. Middle Atmosphere Variability in the UKMO Unified Model. UGAMP Technical Report No. 42, 44pp. Also issued as UK Met. Office Climate Research Technical Note No. 76. The UGAMP stratosphere-mesosphere model. UGAMP Internal Report No. 34, 10pp. The UGAMP AMIP SST datasets. UGAMP Technical Report No. 30, 26pp. Mean climate and transience in the tropics of the UGAMP GCM. Part I: Sensitivity to convective parameterization. UGAMP Technical Report No. 29, 61pp. Synoptic validation of climate models: Aspects of variability in the tropics of the UGAMP general circulation model. UGAMP Technical Report No. 27, 15pp. A quasi-geostrophic ocean model for the simulation of flow in regular or irregular shaped domains. Imperial College Internal Report, 62pp. Non-hydrostatic modelling for studies of open-ocean deep convection. In Deep convection and deep water formation in the oceans. P.C. Chu and J.C. Gascard (Eds. ), Elsevier Science, 325-340. A non-hydrostatic primitive equation ocean model. Imperial College Internal Report, 91pp. The non-hydrostatic pressure coordinate primitive equation mesoscale atmospheric model of M.J. Miller. Imperial College Internal Report, 69pp. Metplot. A package for graphically displaying two-dimensional fields of scalar values using contours, hatching or colour shading or two- dimensional vectors using arrows. Imperial College Internal Report, 29pp. ERS-1 orbit scenario studies: the relative merits of 17- and 35-day repeat cycles for mapping statistics of oceanic variability. Final report to the European Space Agency on ERS-orbit scenario studies for oceanography. A quasi-geostrophic ocean model. Some Introductory notes. Imperial College Internal Report, 49pp. A two-dimensional, non-linear study of mesoscale cellular convection. Ph.D. thesis, University of London, 192pp. 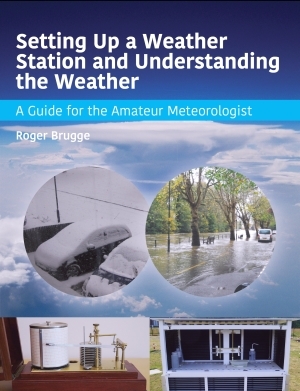 August 2016: Details and order form for this new book about weather observing. Details and order form for this limited edition publication. My temperature forecasts explained in detail for the British Isles, Europe, North America and worldwide. Read about and order this NEW book about the weather of Reading.